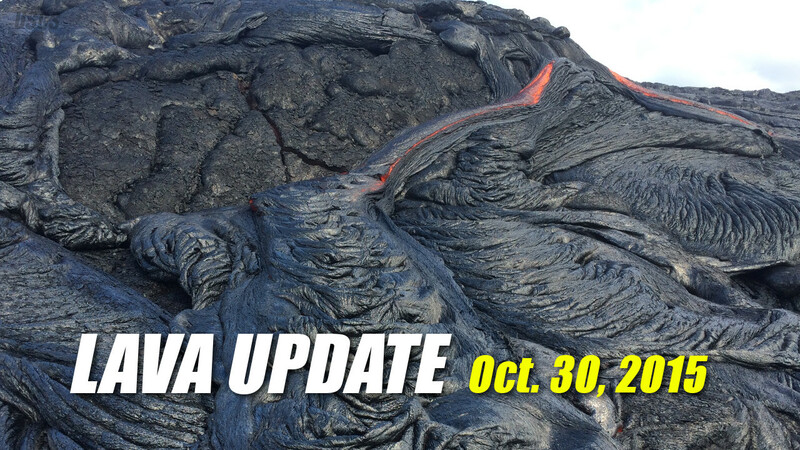 Today's Kilauea and Mauna Loa volcano activity report, includes recent maps and imagery. There is no lava flow threat to nearby communities. Deflationary tilt switched to inflationary tilt at the Kilauea summit on Thursday at around noon, and is continuing at a moderate pace. Mauna Loa volcano is not erupting. The most recent weekly update was issued yesterday. Activity Summary: Eruptions continue at Kīlauea Volcano’s summit and in its east rift zone at Puʻu ʻŌʻō. Inflationary tilt is occurring at the summit at a moderate rate. The lava lake level is roughly 60 m (197 ft) below the Overlook crater rim. Scattered breakouts remain active northeast of Puʻu ʻŌʻō, within about 7 km (4 miles) of the vent. There is no lava flow threat to nearby communities. Summit Observations: Deflationary tilt switched to inflationary tilt Thursday at around noon, and is continuing at a moderate pace. The lava lake level is rising responsively and is currently about 60 m (197 ft) below the Overlook crater rim. During the past day, steady high tremor and associated spattering activity at the lake’s surface has been briefly interrupted a couple of times. Summit sulfur dioxide emission rates averaged 3,400 metric tons per day for the past week. Puʻu ʻŌʻō Observations: Web cam images this morning show no significant change in eruptive activity within the crater. Tilt measured at Pu’u ‘Ō’ō, which has been minorly deflationary may be turning around as of this morning. No significant changes in seismicity have occurred. The sulfur dioxide emission rate from all East Rift Zone vents was about 150 metric tons per day when last measured on October 21, 2015. June 27th Lava Flow Observations: This morning, webcam images show that scattered breakouts remain active between about 2.2 and 6.4 km (1.4 and 4 mi) northeast of Puʻu ʻŌʻō. There is no lava flow threat to nearby communities. 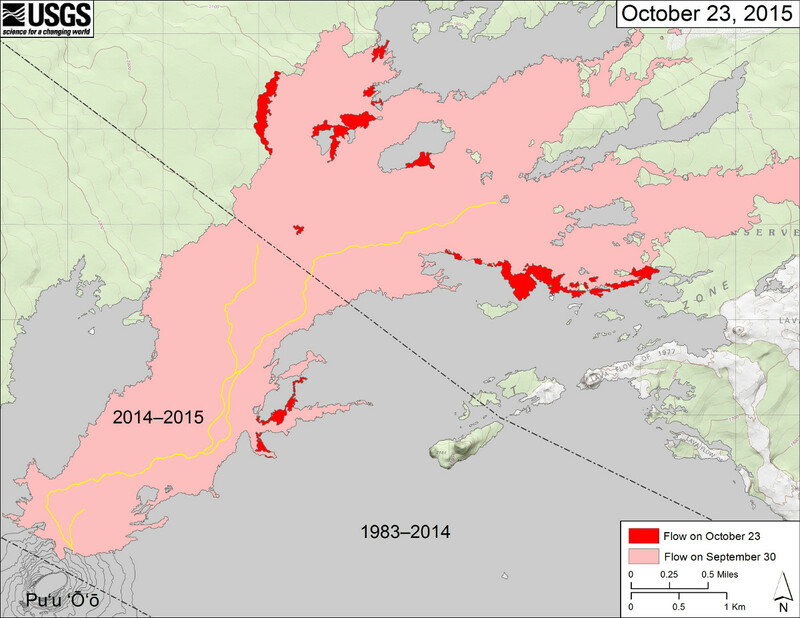 This USGS map shows recent changes to Kīlauea’s active East Rift Zone lava flow field. The area of the flow on September 30 is shown in pink, while widening and advancement of the flow as of October 23 (based on satellite imagery and ground mapping) is shown in red. The yellow lines show the active lava tube system. Puʻu ʻŌʻō lava flows erupted prior to June 27, 2014, are shown in gray. 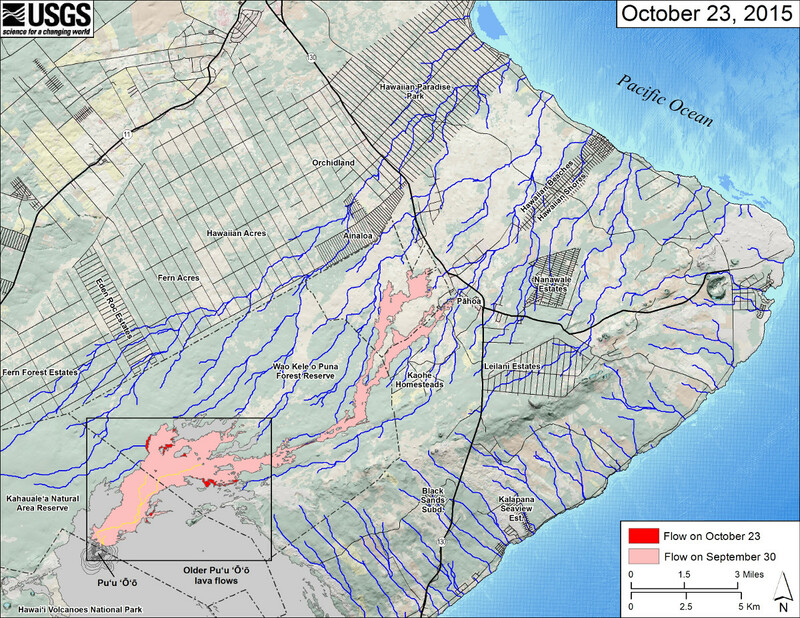 This small-scale USGS map shows Kīlauea’s active East Rift Zone lava flow in relation to the eastern part of the Island of Hawaiʻi. The area of the flow on September 30 is shown in pink, while widening and advancement of the flow as of October 23 is shown in red. The yellow lines show the active lava tube system. Puʻu ʻŌʻō lava flows erupted prior to June 27, 2014, are shown in gray. The black box shows the extent of the accompanying large scale map. The blue lines show steepest-descent paths calculated from a 1983 digital elevation model. Because the flow field is changing very little at the moment, mapping of the lava flow is being conducted relatively infrequently. On Thursday, September 17, the Volcano Alert Level and Aviation Color Code for Mauna Loa was elevated to Advisory/Yellow based on long-term trends in both earthquake and deformation monitoring data. Activity Summary: Mauna Loa is not erupting. The seismicity rate is elevated above background, though at a lower weekly rate than reported in mid- to late-summer. Earthquakes occurred beneath Mauna Loa’s upper Southwest Rift Zone at depths less than 13 km (8 miles). Deformation data are still consistent with inflation of magma reservoirs beneath Mauna Loa’s summit and upper Southwest Rift Zone.